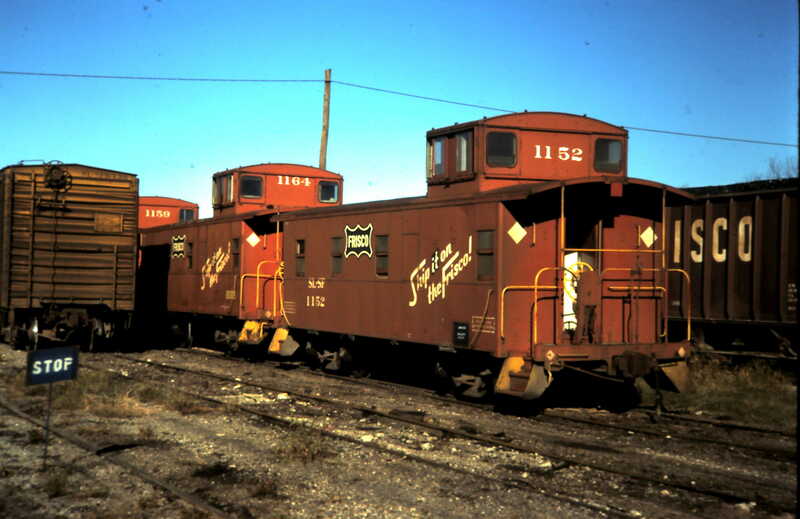 Caboose 1164 Enid, Oklahoma (date unknown). Train is just crossing the railroad crossing at grade, with automatic interlocking, with the C.R.I.P. (Chicago, Rock Island & Pacific) at mile post 585.0. It is eastbound on the Beaumont Subdivision. Interesting to note the Frisco’s Perry Subdivision used the Beaumont Sub between Steen and Enid (1.8 miles). 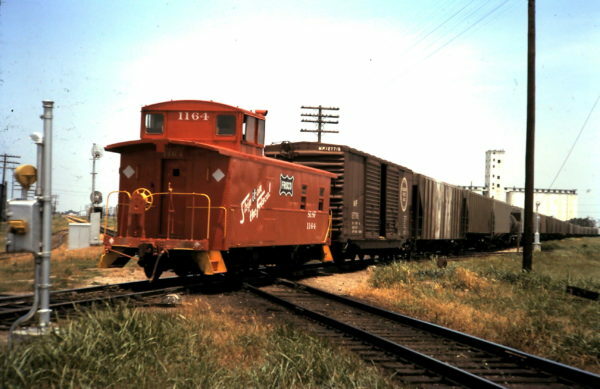 This train left Enid to the west at mile post 585.7 (Perry Subdivision mile 544.9). The photographer is southwest of the diamond. In the distance just to the left of the caboose is the southbound interlocking signal for the Rock Island. Note the round targets have been trimmed on the main track side due to close clearance. Further to the left, this is created by the close proximity of the connecting track on the northwest quadrant of the diamond crossing. This track provided access between the Rock and Frisco. It also provided access to the south end of the Pillsbury Mill and Elevator complex. Pillsbury is just out of view beyond the left edge of the photo. Just below the third freight car from the caboose is the connecting track to the Santa Fe’s 10th Street Yard. Just to the right of the right hand telegraph pole is the westward interlocking signal protecting the Santa Fe’s access to the Frisco’s main and the crossing diamond. Santa Fe used trackage rights over the Frisco to cross the Rock Island at this point. Also on the right above the train is the Southwest Terminal Elevator. Over the years this elevator has also been operated by and known as the Salina Terminal Elevator Company, Feuquay and Archer Daniels Midland (1970s). It is located at 1700 North 10th Street, Enid, OK. The elevator has a capacity of 1,125,000 bushels. It was built in 1926 and 1927. The elevator’s dimensions are 394’ long by 65’ wide. The silos stand 100’ tall, the horizontal conveyor gallery tops out at 112’, with the work or head house standing 192’ tall. View is looking north northeast. Cabooses 1164 and 1152 (date and location unknown).